We pride ourselves on being a small, family owned practice that ensures consistency and a personal touch to your pet’s treatment. Clients become friends and pets are treated as though they are our own. We endeavour to deliver clinical standards that are up-to-date and of the highest order in both medicine and surgery. Our nurses are dedicated and extremely friendly and helpful. We also focus on holistic treatment and always try to promote preventative measures, to ensure your pet’s healthy living. Free advice can be offered by our nurses on flea and worm prevention, dental care, diets and most behavioural issues. Our holistic approach means that we treat the whole patient, taking into account your pet’s general quality of life, rather than just the symptoms of the disease or ailment. This should not be confused with Homeopathy. 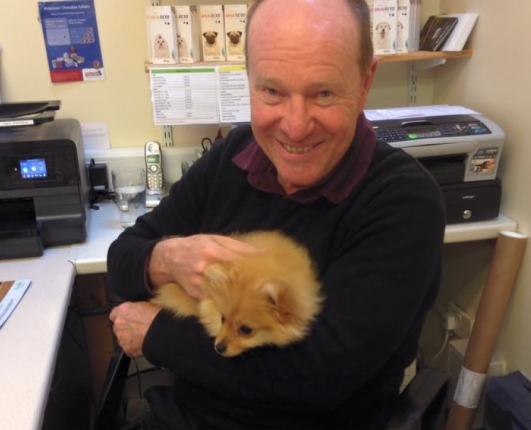 Hello, I’m Duncan MacWhirter, vet and practice owner at Roborough Vet. Along with my wife Hazel and our wonderful practice team, I’d like to welcome you to Roborough Vet. In a world where bigger isn’t always better, I like to think our practice offers something special. We always take the time to get to know our clients and their pets and work with you to make sure they stay happy and healthy. Come to Roborough Vet – arrive as a client, leave as a friend. We’re an RCVS accredited practice with nurse training status which means we’ve achieved the highest professional standards. You’ll get personal attention from our vet and practice owner, Duncan, and our small team of registered veterinary nurses ensuring you and your pet receive a consistent service based on trust and familiarity. We have all the equipment you’d expect to be able to identify and treat your pet’s health problems. The investments we’ve made in our clinic are an investment in your pet’s health. If you’d like send us a message, please complete the form below and we’ll be in touch. In the event of a veterinary emergency, or if you require urgent advice, please do NOT use this form but instead call us on 01752 779 999. We aim to respond to messages as soon as possible but please allow up to 48 hours. All staff are friendly & helpful. Duncan is honest about health issues and explains the problem so you can understand. The best vet in Plymouth by far and the whole staff work so well as a team. Highly recommended. Great vets with great staff, really friendly and professional, would highly recommend. If your pets have fallen behind on their vaccinations, you can get them protected again at a discounted price. Our Boost and Protect Offer is running throughout April and you can take advantage of discounted vaccination prices. Plus you'll get a full health check from Duncan.